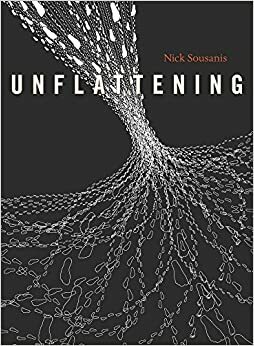 Honestly, I will need to read Unflattening again, and maybe a few more times, to gather up all of the nuances of thinking, but Sousanis puts forth ideas about how to break free of a narrow vision of the world and art and meaning by reminding us that we need to better see how image and art and other perceptions come into play when navigating the world. His use of the comic/graphic story format is incredibly engaging and interesting, and perfectly suited for this kind of philosophical journey. While reading, I kept wondering how to represent my own thinking as the reader (following Terry’s lead) in non-traditional ways. How could I “unflatten” my own experiences with the book? I began, as I usually do but which seemed very appropriate here, with a comic and a remix. I took a page from Unflattening and added my own layer of comic characters, making commentary on the content of the page. My idea was not to lessen Sousanis’ message, but to strengthen it by showing how a reader can interact with text. 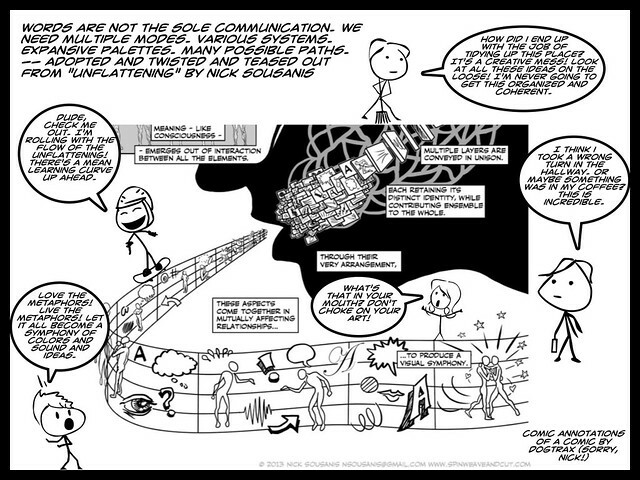 Still, the remix comic exists in flat space. Here, then (I hope) is the link you can use to get to my “aura” of Unflattening. Don’t have the book? No problem. Use the image of the book’s cover here as your object for launching the aura. On your mobile device, click on the link below, which should launch the app, and then point your camera on the image in this post (OK, so that might require some device juggling. Be safe out there, people.) Ideally, a video of me should emerge in the augmented layer of the book’s cover. I hope it works for you. It did for me, when I tested it. If not, the above screenshot is pretty nifty, with the illustration web of footprints running through my face (and what’s up with my eyes? I must be in the midst of some keen perceptions there). 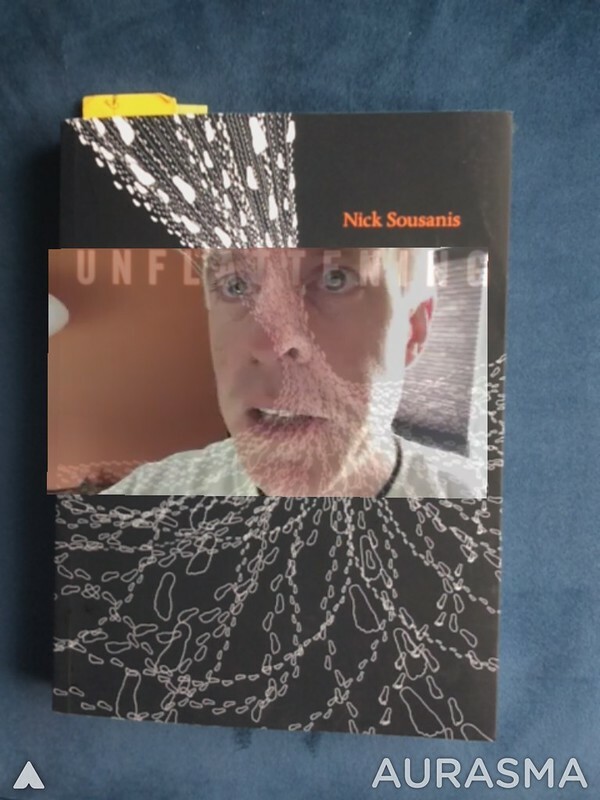 It also occurred to me that I could use a nifty tool in the Firefox browser that lets you get a 3D look at websites, and that I could use that tool to look at Sousanis’ own website where he writes about the writing of Unflattening. I love how he uses the last part of his book to talk about what influenced individual pages. I am a sucker for “behind the scenes” of writers. In using the 3D view tool in Firefox, I would be making the leap from the book to the author writing about the book that I was reading, and I would be using yet another lens to see what he was writing about. Maybe. I’m not sure it succeeded on that level, but it is still an intriguing look at how to use “multiple engagement points” to look at the web. I took a tour. More on that later venture …. This entry was posted in Apps, books, RhizoLearning. Bookmark the permalink. Good news: This is a rare gift to be able to share this co-labor with you. Bad news: No joy with the Aura. Prolly me. Will try again later. antispam: pours wee as in “The rumpelstiltskin pours a wee dram for hiself after a long day on the fairytale circuity. Love what you guys are doing with this. I guess I will have to order a second copy, because I need to re-read a few times, and my colleagues will not give mine back. I hope this convo goes on for a while….. I have added a link to your blog posting to the “Reviews and Interviews” page on the Unflattening Portal we are creating. Terry Elliott has a lesson he created on the site on how to use SnagIt. Might you be willing to give directions on how students could annotate with Aura? If you or your students have anything else to share, we are interested.